...Creator's eating plan, His lifestyle set out in Holy Script, requires serious commitment. If you want more than anything to please the Father, this guidance for Biblical eating for cleanliness and nourishing of His temple ("whose temple you are") is a must. 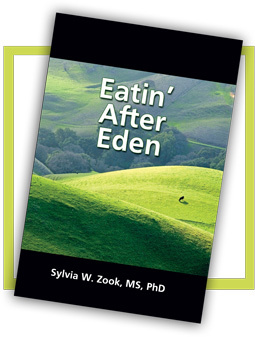 Eatin' After Eden supplies easily understood details regarding vital unique health benefits of clean animal-source foods, and the consequences of rejecting God's wellness plan. "My people perish for lack of knowledge," He says. His knowledge empowers you to take control of your diet and lifestyle for optimal health. Simply stated, exceptionally well-documented research (convenient indented footnotes rather than end notes) of some of the latest and oldest studies together with Biblical principles provide you comprehensive, fascinating truth you can use. Would you believe this anointed, 284-page health optimizer is available for lthe price of a meal in a good restaurant? 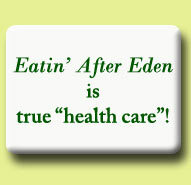 EACH OF THE 11+ CHAPTERS IN EATIN' AFTER EDEN IS A STAND-ALONE-BOOK IN ITSELF—ALL FOR THE PRICE OF ONE! WHEN THE CHAPTERS ARE READ TOGETHER THERE IS A SYNERGISTIC EFFECT THAT CAN EXPONENTIALLY ENHANCE YOUR ACHIEVEMENT OF AN ADVANCED LEVEL OF WELLNESS.